Arbroath Harbour: 53 annual pontoon berths. Six pontoon berths allocated for visitors. Security entrance onto pontoons which supply electricity & fresh water. 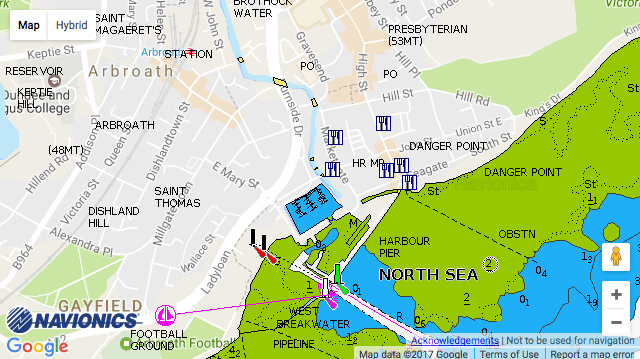 A crew room at the harbour is available for visiting yacht owners with toilets, showers and laundry facilities. Half height harbour gates maintain 2.0m of water at all times in the marina. There is also a diesel dispensing facility in the harbour. Railway and bus station within one mile from the harbour. An abundance of shops, pubs and restaurants nearby as well as the Signal Tower Museum and Arbroath Abbey.